The Influenza virus is the cause of the flu—an illness of the respiratory tract that is very contagious. Severity of the illness ranges from mild to severe to even death. High risk populations for flu complications include children (< 2 years), elderly (≥ 65 years), and those with medical conditions (e.g., weakened immune system, chronic lung disease, and asthma). It is recommended that everyone who is eligible to be vaccinated should get vaccinated each year. Symptoms of the flu consist of some or all of the following: fever/chills, cough, sore throat, runny/stuffy nose, body aches/muscle aches, headaches, fatigue, diarrhea and vomiting—which is more common in children. The flu is very contagious. Adults can infect others within 1 day before they display any symptoms and 5 to 7 days after becoming sick. Symptoms may appear anywhere from 1 to 4 days after the flu virus has entered the body. Therefore, the virus can be spread before the infected person is aware that they are infected as well as while they are sick. People who are infected with the flu may not have symptoms and they can spread the virus during this time. The flu can be spread within a 6 feet distance. Experts believe that the virus is spread through droplets from a sneeze, cough or talk. These droplets may be inhaled or land in the mouth or nose or another individual. Another way the flu can spread is through contact with objects contaminated with the virus then transmission by touching the mouth or nose. Steps in fighting the flu include getting the flu vaccine. Use preventative actions to stop the spread of germs and take antiviral drugs when prescribed by a physician. 1)Although it is may not be 100% effective, getting the flu shot is the most important step in protecting against the flu. Everyone 6 months or older should receive the flu shot. Children younger than 6 months old who cannot receive the flu shot should have their caretaker get the flu shot instead. 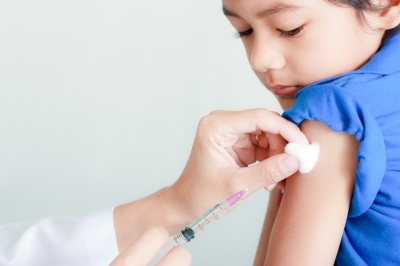 People who have high risk should get the flu shot to prevent severe complications. 2)Use preventative actions to stop the spread of germs. This includes washing hands regularly with soap and water or use alcohol based hand rub; avoid people who are sick; cover nose and mouth with tissue when coughing or sneezing; do not share utensils without properly washing them first; and disinfect surfaces that are frequently touched. 3)Take flu antiviral drugs when a physician prescribes them. Antivirals are the second agent besides the flu shot, but they are not available over-the-counter. Antivirals can shorten the duration of the illness and it works best when started within 2 days of feeling sick. Trivalent inactivated vaccines (TIV) contain inactivated H1N1, H3N2, and Type B flu viruses. Because the viruses are inactivated they cannot cause the flu. The mechanism of action is stimulating the immune system to develop antibodies to the influenza viruses that are likely to circulate for the upcoming flu season. Examples of TIV include Fluvirin, Fluzone, Flucelvax, and Afluria. Afluria is for children 9 years or older and Fluvirin is for children 4 years or older. Fluzone is available as prefilled syringes containing 0.25 mL pediatric dose, 0.5 mL regular dose, high dose 0.5 mL intramuscular injection and 0.1 mL prefilled intradermal microinjection. Intradermal Fluzone has a smaller needle and contains a higher concentration of antigen. Single and multi-dose vials are also available. Fluzone is made from viruses grown in embryonated chicken eggs. The virus is then inactivated and purified to make a clear suspension. Fluzone does not contain antibiotics or latex. Fluzone can be given to children ages 6 months or older. Fluzone high-dose is for those 65 years or older and the intradermal dose is for ages 18 to 64 years old. The efficacy of Fluzone was determined by measuring seroconversion. Seroconversion is the amount of antibody against a microorganism in the blood after vaccination. In healthy children ages 6 to 35 months, 88.2% of patients were protected against type A H1N1, 91.2% against type A H3N2, and 20.6% against type B. In healthy children ages 3 to 8 years old 78.3% were protected against H1N1, 61.2% against H3N2, and 53.3% against type B flu strain. In patient ages 18 to 64 years old 60.5% were protected against type A H1N1, 74.8% in type A H3N2, and 54.2% in type B flu strain. In patients 65 years of age or older, 23.1% were protected against type A H1N1, 50.7% in type A H3N2, and 29.9% in type B flu strain. Side effects from Fluzone include injection site reactions, redness, headache, irritability, drowsiness, and myalgia. It should not be administered to anyone allergic to egg proteins or other components of the vaccine. Flucelvax is a new trivalent cell-culture-derived seasonal flu vaccine approved in 2012 for people ages 18 years and older. Flucelvax is made from viruses that are grown in Madin Darby Canine Kidney (MDCK) cells. It is produced using three influenza virus strains that are likely to cause flu the upcoming season. They are allowed to replicate, then inactivated, and the influenza antigen is extracted for the vaccine. An advantage of Flucelvax is that the cell line can be replicated continuously, it can be frozen and used later, and the virus strain will not undergo molecular changes during production. Also, Flucelvax does not contain preservatives or antibiotics commonly found in other flu vaccines. Preservatives used in other vaccines may increase shelf life, but may cause an allergic reaction. Antibiotics used in other vaccines are used to inhibit bacterial growth for storage purposes, but may cause resistance. Flucelvax is dosed and administered at 0.5 mL by intramuscular injection via prefilled syringe. Typical side effects include pain or redness at the injection site, headache, and tiredness. Safety and efficacy has not been established in pregnant or nursing mothers, and is not recommended for people over the age of 65 due to lowered antibody response. Flucelvax should not be used in people with a history of severe allergic reaction to the ingredients. The tip caps of the prefilled syringes are made of latex which may cause an allergic reaction. The efficacy of Flucelvax is measured in percentage seroconversion for patient ages 18 to 49 years old. After vaccination 62% of patients developed antibodies against Type A H1N1 strain, 85% had antibody against Type A H3N2, and 77% had antibodies against Type B virus strains. Live attenuated influenza vaccines (LAIV) contain live H1N1, H3N2, and Type B flu viruses that can cause symptoms of the flu. The mechanism of action is stimulating the immune system to develop antibodies to the influenza viruses that are likely to circulate for the upcoming flu season. Flumist is an LAIV that is dosed and supplied as 0.2 mL prefilled intranasal spray. It is approved for persons 2 to 49 years of age. The dose for previously vaccinated children 2 to 8 years of age, and children, adolescents, adults 9 to 49 years old is one dose (0.2 mL). Children 2 to 8 years old that have not been vaccinated previously should receive 2 doses administered at least 1 month apart. Common side effects include nasal congestion, runny nose, sore throat, and fever. Flumist demonstrated 44.5% in reduction of influenza rate compared to control in children 6 months to less than 5 years of age. In another study, the efficacy of Flumist in children was 93.4% during the first year and 87% during the second year. Flublok was FDA approved in 2013 for people ages 18 to 49 years old. It is a novel trivalent vaccine manufactured by recombinant DNA technology using an insect virus (baculovirus). It contains hemaglutinin antigens of H1N1, H3N2, and Type B flu viruses. The flu virus or eggs are not used for production of Flublok. The mechanism of action is stimulating antibody production to hemagglutinin antigens of influenza virus strains. An advantage of using Flublok is that it does not contain antibiotics, preservatives, egg proteins, and the cap is not made of latex. In an event of a pandemic, Flublok can be produced much faster than the common method of using chicken eggs or the flu virus. Flublok is dosed and administered at 0.5 mL for intramuscular injection via prefilled syringe. Typical side effects include injection site pain, headache, malaise, and fatigue. Flublok should not be used in people with a history of severe allergic reaction to the ingredients. Flublok demonstrated 44.6% efficacy against all strains of influenza virus in a study on patient’s ages 18 to 49 years old. There are two recommended antiviral drugs Tamiflu (oseltamivir) and Relenza (zanamivir). The mechanism of action of these drugs is by inhibiting the influenza virus enzyme neuraminidase, which affects the virus’s ability to release particles and spread the virus. Antivirals are used to shorten the duration of the flu symptoms as well as for prevention. Oseltamivir is available as pill or liquid formulation. In pill form, it comes as 30 mg, 45 mg, and 75 mg capsules. In the oral suspension form, its final concentration is 6 mg/mL. Oseltamivir is effective against influenza virus strains type A & B. Side effects include nausea, vomiting, runny or stuffy nose, and diarrhea. Is use for treatment of flu in patients 2 weeks of age and older who have been symptomatic for no more than 2 days and prevention of flu in individuals 1 year and older. For treatment of the flu, dosing is 3 mg/kg twice daily for 5 days in pediatric patients 2 weeks to less than 1 year old; 75 mg twice daily for 5 days if 13 years and older; and between 1 and 12 years old the dosing is 30 to 75 mg twice daily based on weight. For severe complications, the duration can be over 10 days. For prevention after close contact with an infected individual the dose for persons older than 13 years is 75 mg once daily for at least 10 days. Tamiflu has been administered for up to 6 weeks for prevention. Treatment or prevention should start as soon as possible and within 48 hours of symptoms or contact with an infected individual. The efficacy of Tamiflu was established in a prophylaxis study for community outbreak of the flu in patient ages 13 to 65 years old. Tamiflu taken for 45 days reduced occurrence of flu from 5% to 1%. In another study, Tamiflu was taken two days prior to onset of symptoms reduce occurrence of flu from 12% compared to 1%. In a pediatric study of individuals age 1 to 12 years old, Tamiflu reduced the development of flu from 17% to 1%. Tamiflu when taken at 75 mg twice daily for 5 days starting within 40 hours of onset of symptoms there was a reduction in time to improvement by 1.3 days in adult subjects 18 to 65 years old compared to those receiving placebo. In geriatric patients (≥65 years old) taking 75 mg twice daily for 5 days, there was an average reduction of 1 sick day compared to the placebo. In pediatric patients age 1 to 12 years old taking 2 mg/kg twice daily within 48 hours of onset of symptoms, there was an average reduction of 1.5 sick days compared to the placebo. Oseltamivir efficacy was not shown in patients who have symptoms after 48 hours. Zanamivir is available as an inhaled powder. It is not recommended for patients with underlining chronic airway diseases (e.g., asthma, COPD) due to bronchospasm. Zanamivir is approved for the treatment of the flu in patients 7 years or older, and prophylaxis in patients 5 years or older. For treatment of the flu, it is dosed at two inhalations (10 mg) twice a day for 5 days. For severe complications, the duration can be more than10 days. For prophylaxis use, it is dosed at two inhalations (10 mg) daily for 28 days within 5 days of outbreak. For children 5 years or older, Relenza was dosed 10 mg inhaled once daily or placebo inhaled once daily for 10 days within 36 hours onset of symptoms. The result was a reduction of laboratory-confirmed influenza infection of 19% in the Relenza group compared to 4.1% in the placebo group. For people 12 to 94 years old, Relenza was dosed 10 mg inhaled once daily or placebo inhaled once daily for 28 days within 36 hours onset of symptoms. There was a reduction of laboratory-confirmed influenza infection from 6.1% in the Relenza group compared to 2.0% in the placebo group. Possible side effects from prevention doses include fever and/or chills, and joint pain. In two separate studies in adults and adolescents, Relenza was dosed at 10 mg inhaled twice daily for 5 days within 48 hours of onset of symptoms. In one study, there was an average reduction of 1 sick day compared to the placebo. In the other study, there was an average reduction of 1.5 sick days compared to the placebo. In children ages 5 to 12 years old, Relenza dosed at 10 mg inhaled twice daily for 5 days within 36 hours of onset of symptoms reduced average sick days by 1 sick day compared to placebo. Side effects of treatment doses include dizziness and sinusitis. Fluzone Package Insert. 2012. Novartis Vaccines and Diagnostics, 1 June 2012. Web. 23 January 24, 2013. Flublok Package Insert. 2013. Web. 23 January 24, 2013.